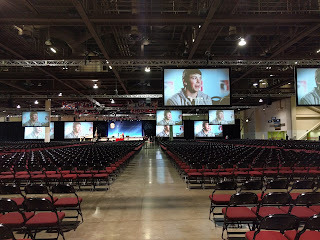 Rehearsal for Opening Ceremonies at Convention. Well to me, communication is story telling. We’re sharing the stories of real events. It’s inspirational. The facts, the names, the impact, the awards, the hard work, the volunteerism, the efforts—everything is real. It’s inspiration! And the story we’re sharing? How you—a powerful network of Elks—are building stronger communities with our funds. How are we sharing the story? Through our website, news articles, brochures, letters, social media, infographics, Heartbeat, Midday, and my favorite—films. You, a powerful network of volunteers, bring the stories to life. And this year, the films that we created, are so moving and so powerful, that I have to grab tissues every time I watch them. This year, we shared a total of nine films during the 2017 Elks National Convention in Reno. Nine films that tell the story of the impact that you are making in your communities. A 501(c)(3) public charity, the Elks National Foundation helps Elks build stronger communities through programs that support youth, serve veterans and meet needs in areas where Elks live and work. For more information on the ENF, visit elks.org/enf.